Some good discounts on some upcoming Vita titles. Check the video to see which you like, then check the release dates and prices. 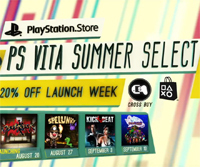 Remember, each title is cross buy with PS3 and Vita! This week, check out Divekick for $8 on PS+. Check out our review... we gave it an 8.5/10! Comment below... are you going to pick up one or more of these? Which one(s)?